I didn't get to post the window pictures last night....a bit too tired to blog. And, with all this humidity, all I wanted to do was sit in front of the a/c. So.....hopefully tonight I can do like I promised and post the picture. Well, work we did.....but on the tree house, no. 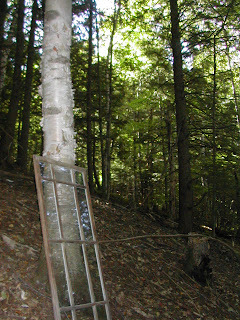 :( As sad as this made me, I was still happy to be in our wooded paradise. We did manage to hike up with a lantern and hang out in there for a while. The pictures don't really do it justice, but I will post them anyway. It was just about dusk so the lantern was a must. It has citronella oil in it which kept the mosquitoes away. In contrast, here's the same shot with a flash. Bragging rights here.....there was much rain recently, and even though the windows and doors are not installed yet, our job on the tin roof is quite waterproof! It was a time consuming project to say the least. On top of fitting the windows, trimming the windows and re-fitting them﻿...the hike up and down the mountain carrying them was exhausting! But, I am not complaining.....really! It is good hard work with great rewards. We even managed to get the north wall soffit finished. The ladders are so long and heavy and tough to move, we decided to do all we could 'one side at a time' and only move them once. Good idea. The deck "door" is actually an antique storm door insert a friend gave me a long time ago. I love that it has been re-purposed as a door itself. We plan to build the back door out of cedar we have on hand. It will resemble a barn style door. I'm not sure how much we will get done before snow falls, let's just hope the doors and windows are secured and trimmed out. 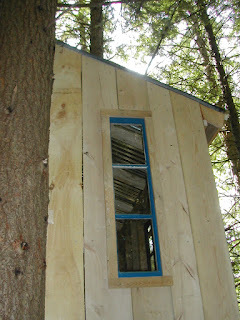 The two south windows got hinged and hung, but they need tweaking. I have to chisel out where the hinges attach on the outside in order for them to close properly. If all goes well with those two, I will move on to the north wall windows after that. We got all the tall bats nailed up. Now we just need to cut the smaller ones above and below the windows and the south side will be completed. Yay!! 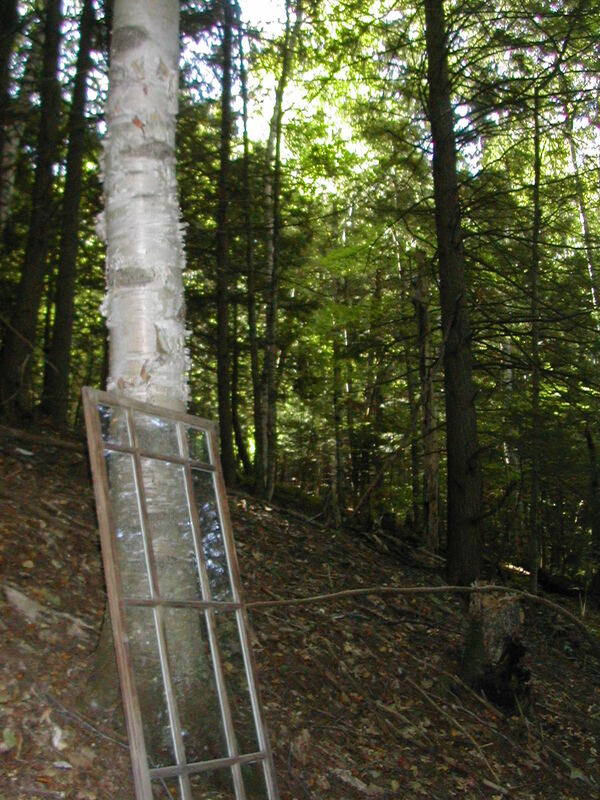 The project of the day was the entrance door to the tree house. With the rough cut lumber we had left over, we built a beautiful barn style door. You know the old saying; "measure twice, cut once"? well...I don't think that applied here. You see, the door was built square, but the door opening was not quite square. I remember saying, "let's make sure this is correct so we won't have to heft this heavy door up and down the mountain". Four trips up and down and four fittings later.....door is in! I will post pictures as soon as my server will allow me to. Now that it's in and I am looking at this picture, I'm really thinking it does need a window in the door. This old window needed a bit of reinforcing....so with my trusty hand drill, I drilled pilot holes for the screws. The braces aren't that nice to look at, but I will touch them up with some paint to camouflage them later on. I even put the 1" trim boards up along with small brass hooks to hold the windows shut. Yes, I am patting myself on the back here. One last thing we did on the south exterior wall was finish up the batting above and below the windows. Progress is being made on the completion of the exterior on the tree house. We finished up the batting on the back side and have moved onto the north side. I mentioned wanting to put a window in the door, and it seems that should have been planned at the design stage. The wheels are spinning on ideas though. If you have any that you'd like to tell me about, please comment! The bank here gets a bit slick, and with the stepping stones it will be a safer climb to the top. Well, the autumn leaves fell and the winter snows have started falling. 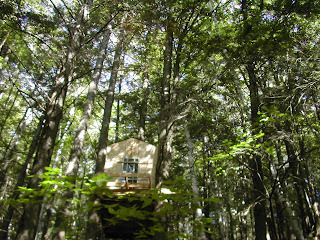 The tree house sits in waiting for work to resume in the springtime. For now though, we visit on occasion to make sure her windows are still attached and the roof is not peeling off from Mother Nature's wrath. I marvel at the progress of my little oasis in the pines. As I look things over, I envision all my plans in motion once the weather breaks. The stairs leading up to the tiny landing at the door. The deck all decked out in pine and railings. The interior and all the design ideas rolling around in my head. Not to wish time away, I wait patiently for spring to break out my tool belt and scratch pad. Hey, great blog! 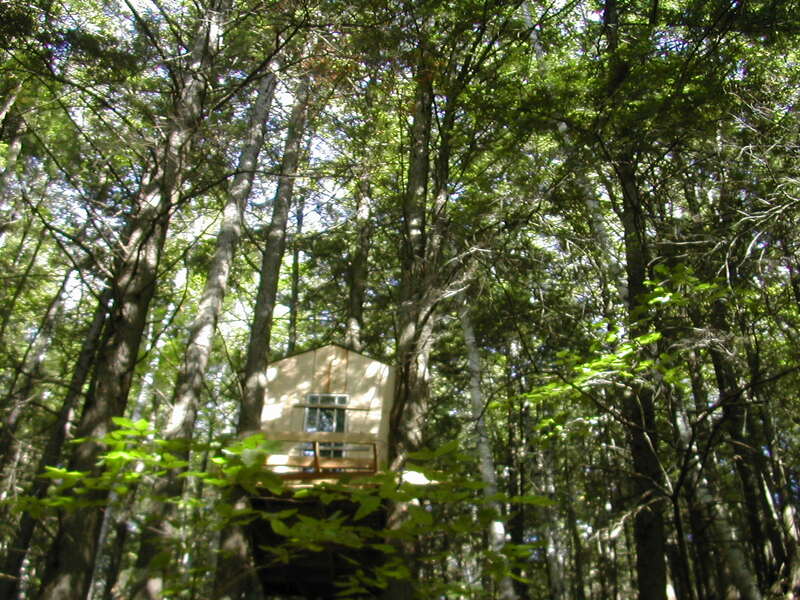 Love the tree house.